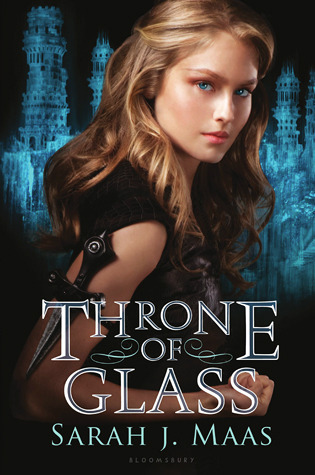 I’ve had Throne of Glass by Sarah J. Maas sitting on my bookshelf since it came out in August, because I had heard nothing but good things and was itching for an awesome new fantasy to read. But alas, my terrible time management got in the way and weeks kept passing without it getting read. However, then I heard Sarah speak on a YA Fantasy panel at the Southern Festival of Books in Nashville, and then I got to hang out with her (and the awesome Kat Zhang) for a few hours afterward because they are nice people and didn’t mind me crashing the party even though they’ve known each other for a while, whereas me…notsomuch. 1) Going by her frequent references to Lord of the Rings/The Hobbit, Buffy, Star Wars, Labyrinth, Harry Potter, and Legend, she is my kind of people. 2) I really need to read her book (especially when I found out it’s the start of what will ultimately be a 6-7 book series — um, yes, please). Now this is the type of YA fantasy I can get behind. It’s got fabulously nuanced characters, tons of action, magic, tension, mystery, court intrigue, more action, monsters, a hint of romance, and did I mention action? From the first chapter, I liked Celaena despite her dark past and hardened nature. She manages to be tough and damaged and brutal while still remaining sympathetic. Her previous life experience has taught her to be wary of everyone she encounters, and her instinct for self-preservation often kicks in before any other thoughts or feelings, but even so, you can sense that aside from being a formidable assassin, she’s still a good person. She eventually manages to form friendships and ties to others that surprise even her, and even though she’s more than willing to kill a man if she must, she does have a sort of self-governing morality that keeps her feeling human in spite of her training. Then there’s the two male protagonists, the Crown Prince, Dorian, and the Captain of the Guard, Chaol. Sarah managed to pull off something pretty tricky with them: a love triangle that is not annoying. They are both admirable and likable characters, and it’s easy to see how Celaena could be a good match for either of them. While the romance with Dorian is more overt, and the relationship with Chaol more subtle, I really enjoyed both and honestly could be happy whichever way the story goes. I do think the back cover copy (“Two men love her”) is misleading, as Chaol takes the vast majority of the book to try to sort out his feelings and even then, isn’t really sure what they mean. And the romance element is very much secondary to the main element — Celaena has much bigger things to worry about than which boy to choose, and both of the men have a lot on their mind besides Celaena. The book gives us insights into all 3 POVs, and I really liked that while they each definitely thought about romance, it wasn’t the only thing on any of their minds. We also get the occasional POV of one of the scheming court ladies, who never became likable, but the insight into her thought process kept her from being one-dimensional. It’s always fun when authors let you into the brain of the “bad guys,” because more often than not, that’s not how they see themselves. The action in the book is mostly centered around the Competition and the training of the Champions. It’s well done, and I could actually visualize most of the fights in my head, as she describes most of them in vivid detail. I always prefer this to fights that are described along the lines of “they fought, their blades flashing blindingly through the air, until she was panting from exertion.”* That’s how a lot of action scenes work in books, leaving pretty much everything to the imagination, and I never really feel satisfied with those. I don’t need a step-by-step recounting of every strike and parry, but my preference is absolutely for more fleshed-out fight scenes. There’s also some non-Competition-related fighting, which is so cool I don’t want to spoil it by saying anything more about it. There’s also magic, which was really interesting. It left me asking a lot of questions, like how do Wyrdmarks work if not through magic, and how is the king able to enforce his law against magic? The magical elements were definitely an important part of the plot, but still not the driving force of this book, which was kind of nice. This story focused a lot more on character building and the mechanics of the Competition itself. I strongly suspect that the magical element will evolve significantly as the series progresses, and I’m anxious to find out more about it. The one complaint I have (which is all a matter of taste, because I’ve read other glowing reviews whose one complaint is the exact opposite of what I’m about to say) is that there are parts where I felt the narrative skipped ahead and I needed a little more information to get from point A to point B. Some transitions felt just slightly jarring. I was never lost, just felt that there was a scene or a snippet missing that I wish was there. I suspect this was because this story is less than half the length that it was in its original form, and while 900 pages would have been far too long, I’m guessing that there was some information lost in streamlining it down to the much more manageable length of ~400 pages that I would like to have had. However, it’s still a pretty hefty book for YA, and I’ve heard other people say it’s too long. So take what I’m saying with a grain of salt. Overall, this was a great read that kept me thoroughly invested throughout. I can’t wait to see where Sarah takes the story from here. Content Guide: Contains a large amount of violence, some gore, devious plotting, references to torture. *not a direct quote from anything, just a sad little example I made up.